After a strong start to 2018, oil prices fell back slightly on Friday morning. 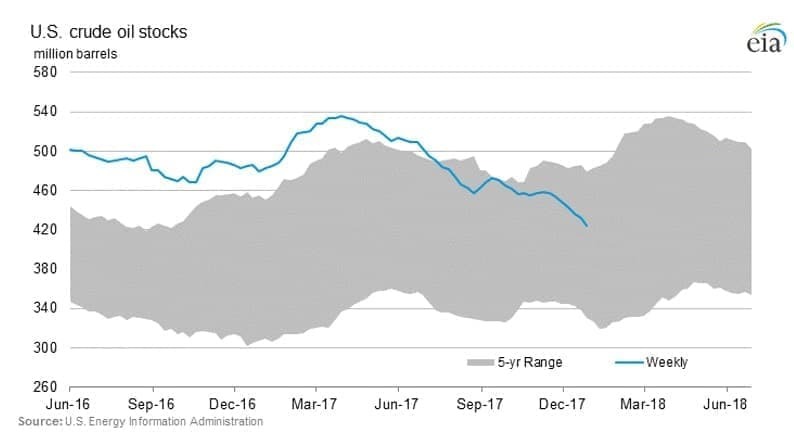 While geopolitical tensions and strong inventory drawdowns were the main culprits for the rise in prices, a strong build in gasoline stocks slowed both WTI and Brent's momentum. Oil prices fell back on Friday during early trading after posting strong gains for much of the week. 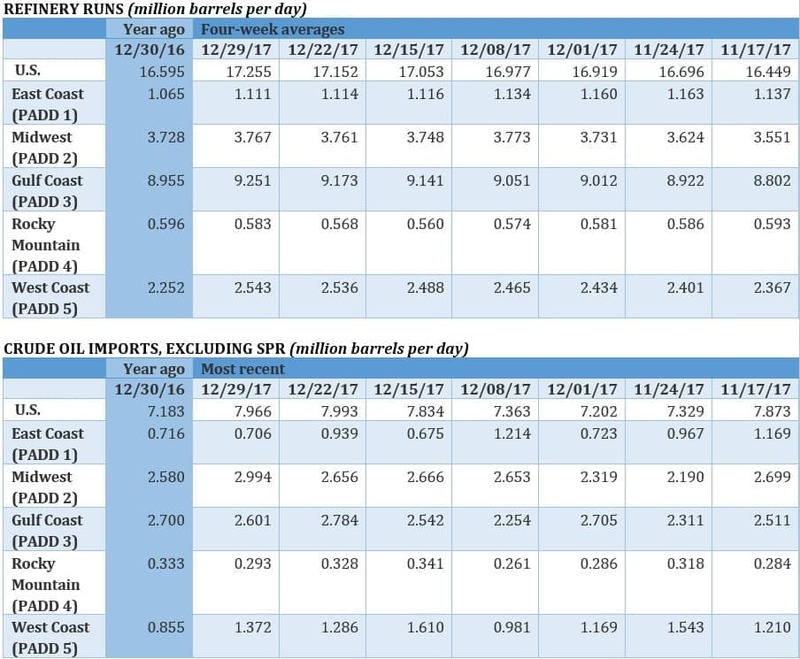 The tension in Iran has helped push prices up, and a strong U.S. crude inventory drawdown added some momentum on Thursday, although that bullish data was slightly offset by the large build in gasoline stocks. Overall, by Friday, it appeared that oil traders had sold off some positions to pocket some of the recent gains. The breather raises questions about the durability of the current rally. Trump admin seeks to open nearly all U.S. coastal areas to drilling. The Trump administration has proposed to open up vast new territory for offshore oil and gas drilling, going so far as to push drilling in areas currently off limits, including the Atlantic, Arctic and Pacific Oceans, as well as parts of the Gulf of Mexico that haven’t seen drilling. The five-year plan for 2019-2024 would replace the Obama-era plan for 2017-2022, and it would include 47 possible auctions that encompass more than 90 percent of the U.S. outer continental shelf. The proposal will take time to finalize and would be vulnerable to legal challenges. Related: Can Blockchain Bring An End To Corruption? Rising confidence in oil stocks. Energy stocks have significantly lagged behind the broader stock market, underperforming even in a period in which oil prices rebounded. But 2018 could be different. With oil prices at their highest level since mid-2015, the outlook looks better for energy stocks than it has in some time. On top of that, a long list of companies have trimmed costs and the oil majors have returned to positive cash flow. This has more investors gaining confidence in the investment case of oil and gas stocks. “2017 was a challenging year for investors but there are now real opportunities in the energy sector,” Olivia Markham, portfolio manager at BlackRock Commodities Income Investment Trust, told Reuters. According to Reuters, investment banks UBS, RBC and JP Morgan issued strongly positive outlooks for the oil and gas sector in recent weeks, while Barclays predicted European integrated oil companies could rise 20 percent from the third quarter. Others agree. “Annus Mirabilis. Highest free cashflow in a decade bodes well for 2018,” Bernstein said, referring to its prediction for European oil majors. EV sales in Norway outpace gasoline and diesel. In Norway, EVs captured 52 percent of auto sales last year, beating out conventional vehicles fueled by gasoline and diesel. With EVs taking a majority of auto sales, Norway is cementing itself as a global leader in the switch to EVs. Norway offers generous incentives for EVs, which make them cheaper than buying a conventional vehicle. Norwegian auto experts told the New York Times that the market share for EVs would have been even higher except that some potential buyers are waiting for Tesla’s (NYSE: TSLA) Model 3. Tesla reports setback in Model 3 production. Tesla (NYSE: TSLA) released production figures on Wednesday, which revealed a disappointing performance for the fourth quarter. "As we continue to focus on quality and efficiency rather than simply pushing for the highest possible volume in the shortest period of time, we expect to have a slightly more gradual ramp through Q1, likely ending the quarter at a weekly rate of about 2,500 Model 3 vehicles," Tesla said in a press release. "We intend to achieve the 5,000 per week milestone by the end of Q2." It is the latest delay in its production schedule, and yet another downward revision. Tesla’s shares fell by 2 percent on the news, but Wall Street has yet to sour on the electric car company. Still, as Bloomberg Gadfly notes, these delays are material, particularly for a company burning through as much cash as it is. Cold weather sweeps U.S.; natural gas prices surge 60x. The deep freeze hitting much of the eastern half of the U.S. has provided a jolt to demand for energy of all types. Regional natural gas prices have spiked, particularly in the New England. While Nymex futures remain subdued, spot prices in New York briefly surged to $175/MMBtu. Higher gas prices have made coal temporarily more competitive. And in some areas, even diesel is in higher demand. That has altered trade flows, with diesel shipments that tend to go from the U.S. to Europe heading in the other direction. 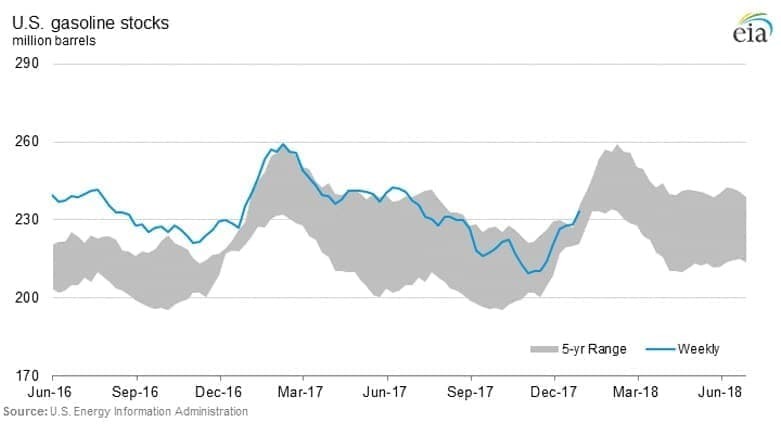 JBC Energy predicts that U.S. diesel demand will be 90,000 bpd higher in January and February than a year earlier. Meanwhile, at least five refineries along the East Coast reported outages because of frozen equipment, although there hasn’t yet been any significant hit to production. China to overtake Japan as world’s largest natural gas importer. As China continues to swap out coal for natural gas, its demand for gas is rising sharply. That likely means that China will claim the mantle of the world’s largest importer of natural gas this year, surpassing Japan. Japan will still be the largest importer of LNG, but China’s combined imports of LNG and pipeline gas will make it the world’s largest importer. China is already the largest importer of coal and oil, but gas is increasingly central to the country’s energy plans. $820 million for oil drilling startup. Investment firm NGP put up $820 million for Luxe Energy LLC., money that will be used to build an oil exploration company from the ground up. It is one of the largest sums ever committed for an oil startup. Luxe had previously acquired acreage in the Permian and sold it, and NGP is reloading the firm with more cash to build another exploration company. The logic behind the investment is for the company to acquire acreage that will be sold off by other oil firms in the Permian who are looking to take a more conservative approach.